DHCP is a network protocol that allows clients to automatically retrieve their network configuration from a local or remote server infrastructure. During the negotiation phase with the server, the client will receive different network parameters, like the mandatory IP address. These parameters are encapsulated into what DHCP calls Options. The TeemIp DHCP Management extension precisely allows network administrators to define and register the DHCP options that are used within their DHCP infrastructure. As described by the ISC, the Dynamic Host Configuration Protocol allows the client to receive options from the DHCP server describing the network configuration and various services that are available on the network. In order to structure its configuration file, the ISC DHCP server groups client options into scopes that cover different segments of the network, from a global coverage down to a unique host: Global, Shared-network, Subnet, Pool, Class, Sub-class and Host. Once registered in the application, these options can be retrieved through the REST/JSON API in order to build the configuration file of an ISC DHCP server. The extension just allows DHCP Managers to store DHCP Options within TeemIp. It doesn't handle scope or server configuration. There is no specific requirements with TeemIp standalone. TeemIp DHCP Management is anyway already embedded in it starting with TeemIp 2.4. 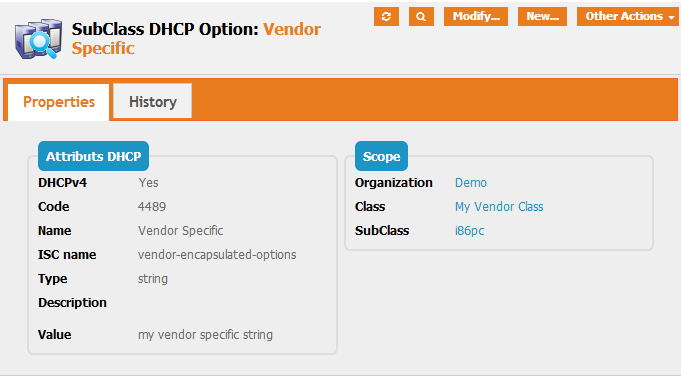 Once installed, the module will add a menu group called DHCP Management where DHCP Options will be managed from. This object is used to document the Global DHCP Options. It has no other attributes than the ones listed above. Details of a DHCP Global Option can be accessed from the specific “Global Options” shortcut menu of the DHCP Management module. This object is used to document the Shared Network DHCP Options. Shared networks in TeemIp are implemented through the VLAN object. A new DHCP Shared Network Option may be created from the specific “Shared Network Options” shortcut menu of the DHCP Management module. It refers to an organization and to a VLAN within that organization. This object is used to document the Subnet DHCP Options. The Subnet scope in TeemIp is implemented through the IP Subnet object. Details of a DHCP Subnet Option can be accessed from the specific “Subnet Options” shortcut menu of the DHCP Management module. It refers to an organization and to an IP Subnet within that organization. This object is used to document the Pool DHCP Options. 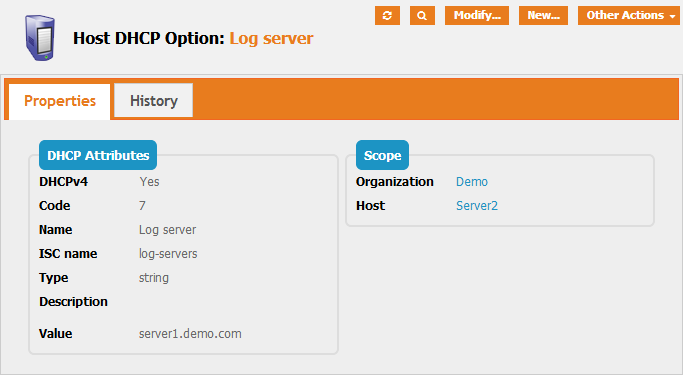 The Pool scope in TeemIp is implemented through the IP Range object. 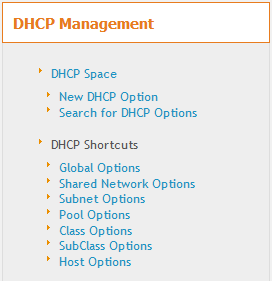 Details of a DHCP Pool Option can be accessed from the specific “Pool Options” shortcut menu of the DHCP Management module. It refers to an organization and to an IP Range within that organization. This object is used to document the Class DHCP Options. It refers to a new typological TeemIp object that models DHCP classes. This is a typological object defined through the Typology configuration menu in the Data administration chapter. 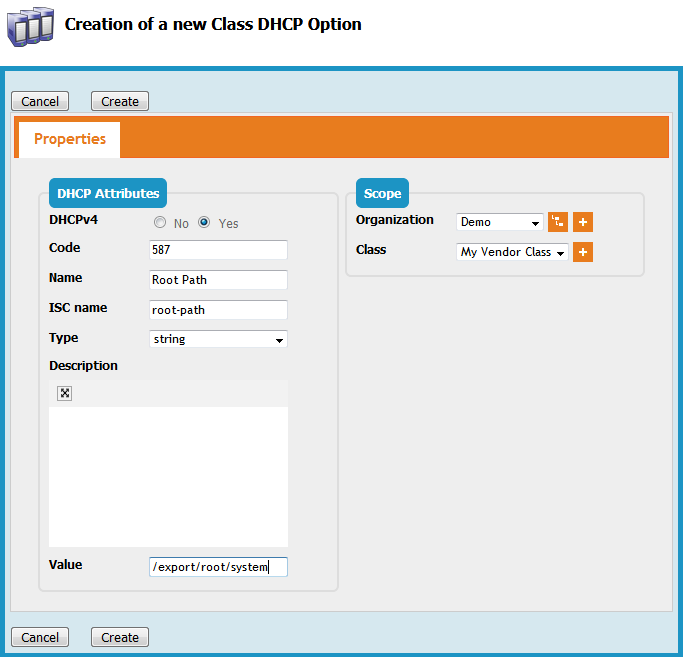 A new DHCP Class Option may be created from the specific “Class Options” shortcut menu of the DHCP Management module. It refers to an organization and to a DHCP Class. This object is used to document the SubClass DHCP Options. It refers to a new typological TeemIp object that models DHCP sub-classes. This is another typological object defined through the Typology configuration menu of the Data administration chapter. Details of a DHCP SubClass Option can be accessed from the specific “SubClass Options” shortcut menu of the DHCP Management module. It refers to an organization and to a DHCP SubClass. This object is used to document the Host DHCP Options. The Host scope in TeemIp is implemented through the Physical Device object. Details of a DHCP Hosts Option can be accessed from the specific “Host Options” shortcut menu of the DHCP Management module. It refers to an organization and to a Physical Device within that organization. The TeemIp DHCP Management extension brings a new profile dedicated to the management of DHCP objects: “DHCP Manager”, a “Person handling the DHCP space”. It has all rights on the DHCP related objects. The DHCP management menu is hidden to the users that don't have the administrator or the DHCP manager profile.